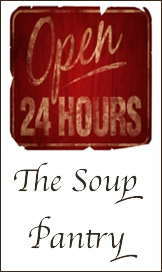 Crockpot Soup Recipes - The crock pot offers a whole new dimension to soup making. While you work or sleep a slow cooker tends your soup, or even chowder delivering perfect results. The perfect and steady temperature in the crock pot allows even creamy concoctions to cook on their own for several hours without burning or scorching. Put all of the ingredients in the crock pot before leaving the house in the morning or before going to bed at night. Let the crockpot do it's magic for several hours and - tada! - out comes a complete meal with fully blended flavors. It tastes like you spent all day hovering over the stove and you don't even have to be home let alone hovering. And when you are home you can bask in the homey ambience that crockpot cooking always seems to impart. Generally speaking, a soup will need to be cooked for 10 to 12 hours at the crock pot's low setting. High temperature cooks the food more than twice as fast and most slow cooker soups need only 3 to 5 hours to cook. 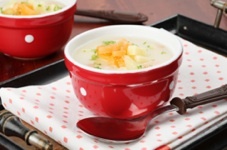 Choose any of the following crockpot soup recipes by clicking on the photo. A Simple Crockpot Potato Soup Recipe. This favorite from our slow cooker soup recipes archive yields a hearty soup that can be adjusted to suit your tastes and diet restrictions. This rustic soup is delicious as it is and adding corn, ham, bacon or anything your family likes, just makes it better. How To Make Chicken Stock in the Crockpot. 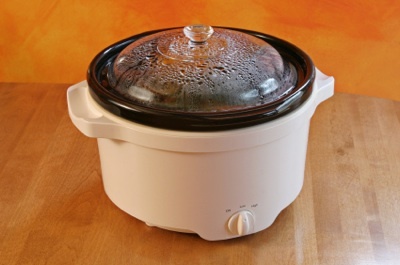 Low crockpot cooking temperatures allow the stock to brew unattended all day or all night. 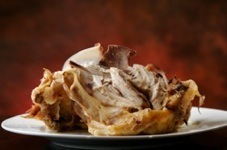 This has to be the easiest way on the planet to make chicken stock from a chicken carcass. Instead of wrapping and refrigerating the chicken leftovers, just put them all into a crockpot and let then simmer into a flavorful stock overnight. It saves fridge room and a lot of clean up time. Sometimes easy is also best.